Gross Weight (GVWR) 2285 lbs. Primary Awning Length 7' 0"
Make unforgettable family memories with the 2019 Forest River Flagstaff MAC 176LTD Folding Pop-Up! At Tradewinds RV Center in Clio, Michigan, we've been helping our customers find the RV of their dreams for years, thanks to our sensational wholesale pricing on our huge inventory of all the top brands! It's never been more affordable to buy your dream RV! You'll save $1000s, and our financing experts will get you the lowest rates anywhere! So come visit us at 4325 W Vienna Rd Clio Michigan 48420. Let our friendly, knowledgeable staff help you find the perfect family RV! Whether you live in the Clio area or anywhere in the country, our 24/7 store to door delivery means that you can pick out your dream RV today, save $1000s, and have it delivered tomorrow! Give us a call at 810-686-0710. Your dream is about to come true! One of the best features of this Folding Pop-Up is the 7' 0" patio awning that opens easily and lets you enjoy the fresh air, protected from the hot sun or the soaking rain! And with a hitch weight of 162 lbs, this rig is easy to tow and set up when you reach your camping destination! You'll be ready to kick back in no time! Plus, the hefty GVWR of 2285 lbs. 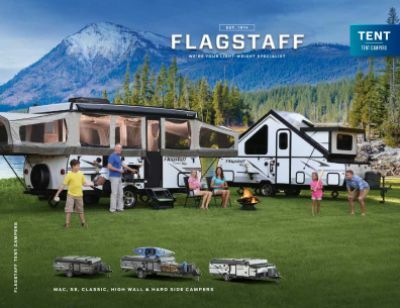 means the 2019 Forest River Flagstaff MAC 176LTD can carry the whole family with no worries! Nothing tastes better than a delicious meal when you're on the road! Thanks to the great kitchen in this Folding Pop-Up, you'll enjoy them every day. The 2 burner cooktop makes hot breakfasts, lunches, and dinners a snap! And the 1.90 cu. ft. refrigerator lets you stock all your favorite foods and cold drinks! At clean-up time, the gallon freshwater tank and 20 lbs. 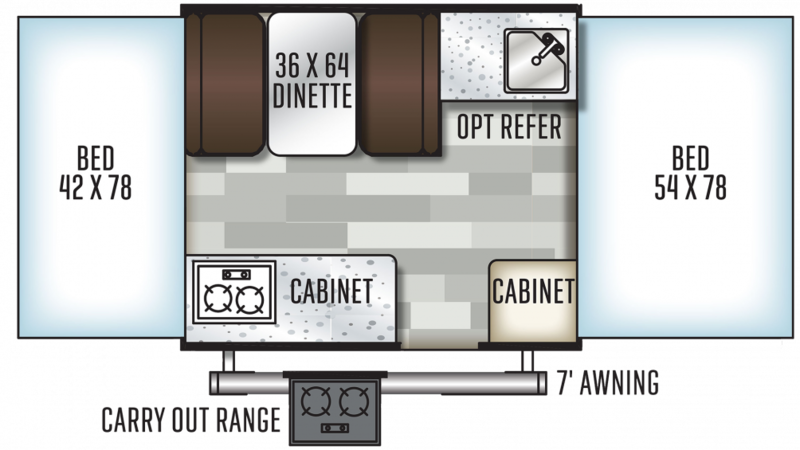 of LP tank capacity will supply you with plenty of hot water for all the dishes!